Graft Cider, the Hudson Valley-based sour cider phenoms, have had a relatively small footprint up until this year. After forming in the fall of 2016, their ciders were only available in New York, Maryland and Washington D.C. But over the past few months, Graft’s team have undertaken an aggressive expansion, moving into a new state each month, starting with Virginia, Massachusetts and Rhode Island. This year, they’ve got Florida, New Jersey, Pennsylvania, Connecticut, Maine and Vermont in their sights. East Coasters, you’ve been warned: It’s time to double your cider budget. Graft Cider was founded by Kyle Sherrer (formerly of Millstone Cellars, which he started with his father), his sister Sara Sherrer and his girlfriend, Sae Kenney. The trio moved to the Hudson Valley, brought on David Hall as cider maker and have slowly added other team members in quality control, yeast management and sales. Kenney says that the pieces for growth and expansion are finally in place, and that’s why they’ve started making such big moves. From its non-stop output and product change-up, it’s clear to see that the folks at Graft do not like to be bored. The brand is home to a number of “lines“: the Core Line; the Book of Nomad line (fruited ciders); the Cloud City line (inspired by the lactose-spiked “milkshake” beers that are so popular in the craft world right now); the Wild Woods line (barrel aged); and the Shared Universe line, a series of collaborations. All of the ciders are unfiltered, gluten-free with no sulfites, sorbates or added additional sugar, 6.9% ABV and fermented with Graft’s house strain of wild brett yeast. Most of these lines rotate monthly or quarterly and Kenney says they think of the lines as stories or story books. To that end, each can features pseudo-psychedelic artwork depicting a man called Nomad looking for his friend named Dog. It’s a lot to wrap your head around. Kenney agrees, and says that the current program is actually dialed back from the full range they’ve put out in the past. “Now, what we’ve decided to do is hone this idea and dial back and figure out who we are,” she explains. 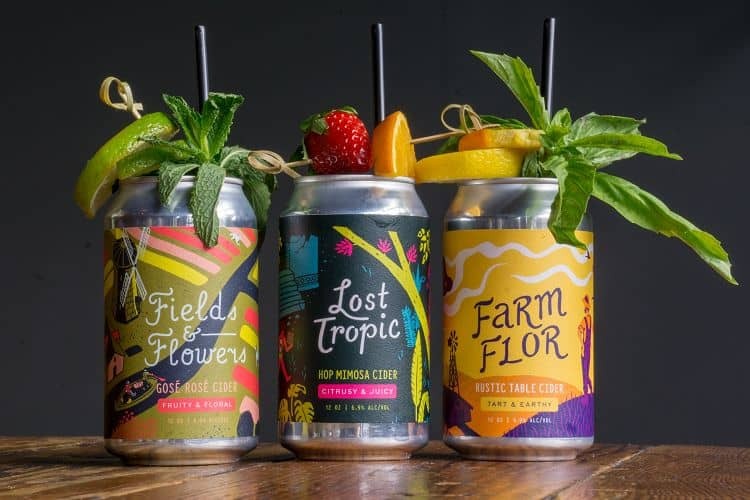 “I used to describe us as an ‘angsty teen,’ and now we’re more like someone who’s coming into themselves, and learning about themselves, and now we have a better foothold on who we are.” Recently, Graft has chosen two of its most approachable ciders to be year-round flagship brands: Lost Tropic (hopped mimosa cider) and Farm Flor (rustic table cider, akin to a farmhouse style beer). We were particularly interested in the Shared Universe line, as collaborations are one of our favorite things about the craft cider community. One of the more recent partnerships was with Finback Brewery in Queens, New York — the outcome was Origami, a hop strawberry mochi cider. Another collaboration was with Collective Arts Brewing in Toronto. They came up with Floating in the Void, a sour cherry and blackberry dreamsicle cider. “There are so many parallels between cider and beer, we thought that’d be a really great way to expand our market and educate the cider consumer who isn’t used to this style,” Kenney says. While Graft’s HQ in Newberg, New York doesn’t include a tasting room, Kenney says they do hope to open customer-facing bars and tasting rooms in New York eventually. “That’s why we do so many events at bars: We want to meet people and answer questions and hang out!” she says. Look for more info on Graft’s Facebook and Instagram account about launch events in your area if you live in one of the states listed above. 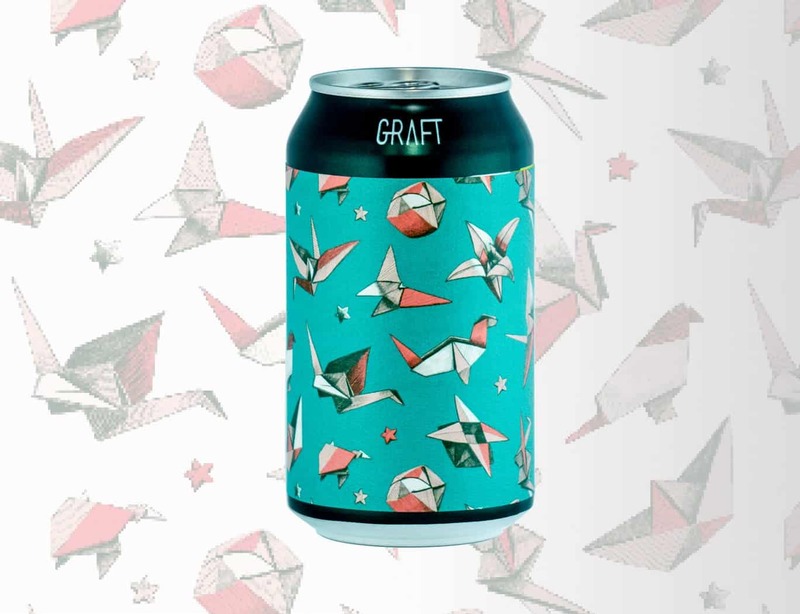 You can also check beermenus.com or untappd.com to see if Graft is available at your favorite bar or bottle shop. Congrats to Graft on this epic East Coast expansion!